The Obama plan would have its maximum impact in the fourth quarter of 2010. Without the plan … the unemployment rate in that quarter would be a disastrous 8.8 percent. Yet even with the plan, unemployment would be 7 percent — roughly as high as it is now. After 2010, the report says, the effects of the economic plan would rapidly fade away. The job of promoting full recovery would, however, remain undone: the unemployment rate would still be a painful 6.3 percent in the last quarter of 2011. 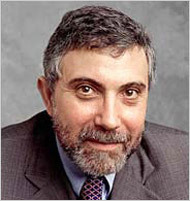 You are currently browsing the archives for the Krugman category.